The quantity of dough is suitable for any size pan, from 8 to 10-inches in diameter. If using a pan at the larger end of that spectrum, simply increase the quantity of quince liquid by about 25%. Extra syrup should be saved to drizzle or brush over the finished tart, giving it a wonderful sheen. 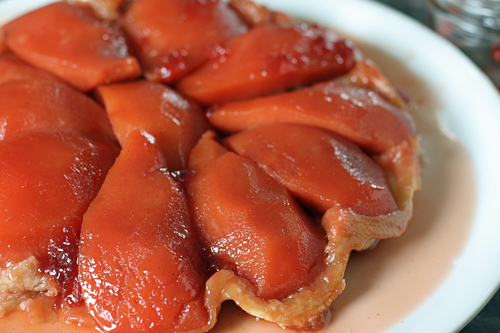 Tarte Tatin should ideally be eaten warm, or room temperature, the same day it’s made. To Make The Dough: In the bowl of a standing electric mixer, or food processor, blitz together the flour, sugar, salt, and butter, until the butter is in small, but discernible pieces, about the size of large peas. Add the water and mix (or pulse) until the dough just begins to hold together. If it looks too dry, add a sprinkle more water. Use your hands to knead the dough for a couple of seconds, just until it comes together, and shape it into a flat disk. Wrap in plastic and chill for at least 30 minutes. To Assemble The Tarte Tartin: Pour 1-1/4 cup of strained quince poaching liquid in a tarte Tatin pan or cast iron skillet. Cook over moderate heat until the liquid is thick and syrupy (the consistency of honey) and remove from heat. The amount should be about 1/4 cup. Lay poached quince quarters, which have been patted dry, snugly against each other, rounded side down, in the pan. Pack them in tightly as they’ll settle down once baked. On a lightly-floured surface, roll the dough into a circle a few inches bigger than the pan you’re using. Drape the dough over the quince, tucking in the edges, and bake on a lower rack in a 375F oven for approximately 45 minutes. The tart is done when the dough is deep golden brown. Remove from the oven and let rest on a cooling rack for a few minutes to settle, then overturn a rimmed serving platter or baking sheet over the tart, and flip the tart over. You may wish to wear long oven mitts and be sure to take appropriate precautions, as hot liquid will inevitably escape, which you’ll likely want to save to glaze the tart.